So Michael has done art on many Bant cards from the Alara block and even one from Commander 2013. His art is also featured on one of the favorite Commanders from the original Commander set. He also has only done a single art for Plains, Island, and Forest, as well as one of the dual lands from Future Sight. He has done art for one of the Eldrazi Titans, specifically the one that gives you card draw. In addition to all the cards referenced above, he has done art for three planeswalkers and he is the only person to have done art for both non-duel deck versions of this vampire planeswalker character. Just a selection of a couple Bant cards from the Alara Block. There are more. Ah, our Bant Commander (Derevi, Empyrial Tactician) from Commander 2013 and one of the favorites from Commander 2011, Kaalia of the Vast. Eldrazi Titan of card draw: Kozilek, Butcher of Truth. I tried to word the clue about Sorin the right way since Michael Komarck did not do the Sorin, Lord of Innistrad art for the duel deck Sorin vs. Tibalt. He did do the original art for it, along with Sorin Markov. He is also currently only one of four artists to have ever done card art for Elspeth, and until last year, was the only person to have ever done art for a Sorin planeswalker card. If you want to see all the cards that Michael has done the art for, click here to be taken to Gatherer. 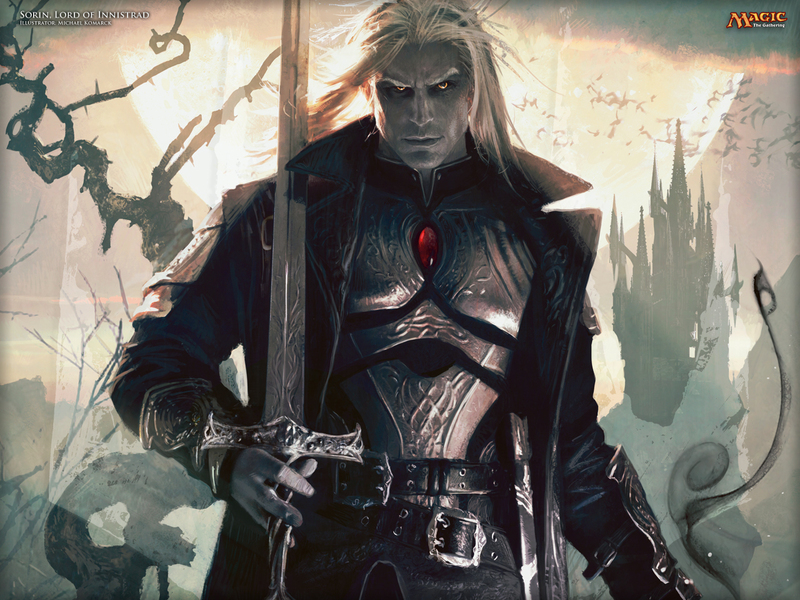 If you want to make Sorin, Lord of Innistrad your wallpaper, click the above image to be taken to the Mothership's (wizards.com) download page for this wallpaper. You can find Michael on Facebook and on his Website. Monday Morning MTG also has Twitter and now Facebook.